In addition, the millennials are much more racially mixed than the older generation as Census Bureau data shows for the 15-34 age group. This increase in racial diversity matters in terms of employment, and hence spending power. Bureau of Labor Statistics data shows that in Q1, only 3% of Asians and 5% of Whites were unemployed in the 25 – 34 age group, compared to 7% of Hispanics and 12% of Blacks. Equally important is that median earnings for Blacks are around 20% less than for Whites/Asians, and 25% less for Hispanics. Importantly also, in terms of potential housing demand, nearly a third of all 18-34 year olds were still living with parents in 2014, up from just over a quarter in mid-2000. These changes matter in terms of demand for basic chemical products, as the chart above of chlorine and caustic soda production from the American Chemistry Council (ACC) confirms. The problem is that the higher-spending Boomer generation has been followed by lower-spending Millennials. 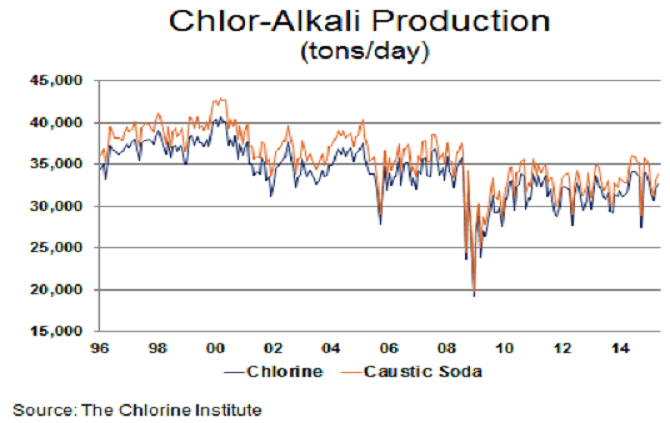 Volumes for both chlorine and caustic soda have thus drifted steadily lower over the past 20 years. Current volumes are actually lower than the lowest levels seen before 2008. And chlorine demand into PVC has been badly hit by the collapse of housing starts which are now less than half the peak levels seen in the early 2000s. The second chart, based on Chlorine Institute data confirms the result of these trends in terms of capacity utilisation. Rates so far in 2015 have been in steady decline with 2015 averaging just 81% versus 83% in 2014 and 86% in 2013. Similarly, the ACC report total chlorine volume is down 3% versus 2014, and caustic volume is down 4.8%. Thus developments in the chloralkali industry highlight the critical importance of focusing on demand-related issues, rather than assuming that lower feedstock costs will automatically lead to success. Companies and investors often say “we don’t need to think about demographics – its too far in the future to matter”. This might have been true 20 years ago, but not today. As European chlorine industry demand confirms, the truth is that “history catches up with us”. And their incomes decline as they enter retirement. The key is the decline in construction and therefore PVC demand. As the chart on the left shows, based on Eurostat data, this peaked in 2007 and has never recovered. Part of the reason is the end of the speculative rush to build second homes in countries such as Spain. Vast numbers of these apartments have never been occupied, and the local population in most holiday resorts is not big enough to fill the gap. The other reason, of course, is the ageing population and lack of babies. Young adults normally provide major support for construction markets. They have to set up home for the first time, and then they often need to have bigger homes when they start a family. Equally, employers have to build offices and factories where they can work. But older people already have somewhere to live, and are instead leaving work to retire. They might in the past have thought about buying holiday homes, but today they are increasingly concerned about having sufficient savings for their retirement. These demographic changes mean that Europe’s adult population is increasingly being dominated by people in the 55+ generation for the first time in history. Even in 1950, life expectancy at birth was roughly equal to retirement age at 65 years. The result, as European chlorine demand confirms, is that the European economy has gone ex-growth. And as the European Central Bank is just beginning to realise, you can print money, but you can’t print babies. The US PVC industry is hitting new problems, to add to the post-2006 collapse of the US housing market. Yet only 10 years ago, it was riding high. Demand into housing (the main outlet) was at record levels thanks to subprime lending, and PVC production had just hit a record 7.3 million tonnes. Even after the financial Crisis, global markets picked up the slack left by the US housing downturn. Exports zoomed to over 40% of total output, allowing production to recover to 6.7MT. Of course, there must have been some volume reduction due to unexpected ethylene shortages. And optimists might hope that the US housing market may see a further boost. But most of the lost volume is secular and not cyclical. PVC is, of course, a major application for chlorine. And chlorine’s co-product, caustic soda, has also seen US net exports decline across the board in H1. This confirms the downturn is secular, and not just due to temporary developments. Yet whilst this decline is taking place, producers are still lining up to expand. Maybe they know something about future demand that has escaped the blog. But it can’t help worrying, as it wrote back in March, that they have fallen into a major trap. They hope that the Boomer-led SuperCycle will return, making advantaged supply once more the key focus. Yet all the evidence suggests we are now moving into a Boomer-led New Normal, where advantaged demand positions will be key to future growth and profit. Chlorine and caustic soda are the bedrock of modern industry. They are used in everything from laundry products to pharmaceuticals. So changes in their business performance are a most valuable guide to what is happening in the real world in which we all live. Having run a major chloralkali business in the past, the blog suspects the outlook for H2 is fairly clear. Producers will keep operating rates low in Q3, and will only be tempted to increase them if stocks continue to remain under control. This may become difficult to manage due to geo-political issues. Russia has been Europe’s second largest PVC customer for many years, and the Ukraine its 3rd largest customer, according to trade data from Global Trade Information Services. And PVC, of course, is one of the main uses for chlorine. Last year, Russia and the Ukraine took around 24% of Europe’s PVC exports, for a total of 236KT. These volumes have already been hit by Ukraine’s civil war; exports to it were down 29% by April versus 2013. And there is clearly potential for a further volume reduction if today’s economic war escalates between Russia and the EU. An accident waiting to happen is perhaps the best way to describe aluminium markets – the key swing outlet for caustic soda. Caustic soda is normally a late cycle product, with sales then focused on the mining industry. Industry leader Alcoa’s results confirm the disappointing trend. It lost money in Q1, whilst revenue fell 8% due to a decline in aluminium prices. A further problem is that aluminium stocks in warehouses remain at more than 10 million tonnes, despite a 43% fall in prices from the 2008 peak. As the blog noted in January, this is sufficient to build 2 years’ worth of cars. The warehouse position is the most scandalous, with buyers forced to wait up to 570 days to obtain their own stored material – and to add insult to injury, made to pay large premiums to obtain prompt delivery of replacement supplies. But whilst Western aluminium producers are finally starting to face up to reality, we can be fairly certain that they will do too little, too late. This is always the problem when markets are unable to operate properly, as wishful thinking rather than reality starts to dominate producer thinking. They have thus allowed themselves to be lulled into a state of false optimism. They wanted to believe stimulus programmes would restore pre-Crisis growth levels, and they have ignored the fact that the warehouse delays kept unwanted inventory off the market. But we all know how this story will end. Aluminium demand will continue to suffer under the influence of today’s high prices, whilst in the end the inventory will appear on the market. When this happens, it will be the innocent producers of caustic soda who will suffer just as much as the aluminium market. Today’s rising inventory are a clear warning that major operating rate reductions are now on the horizon.